In Trials, many rounds can be over in a blink of an eye. A quick “Ace” medal can be achieved with a good opening move and setup. 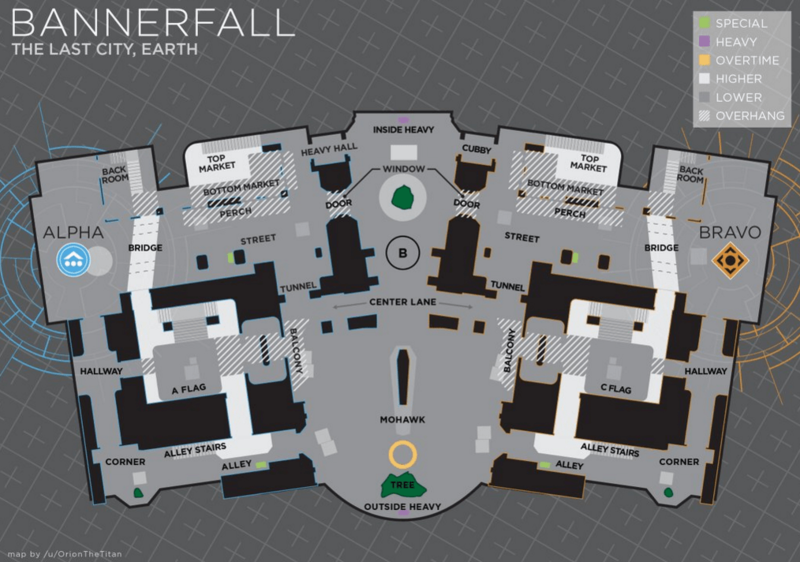 Bannerfall games frequently commence with a race to the catwalks that look into the windows near B. It’s a wild west sniper duel up there, which can go either way. In Trials, however, it’s not always smart to scope that catwalk. It comes down to a coin flip between two good snipers, and if you lose, it’s a very tough spot to be revived. A better move might be sending two up the middle towards the door to get a sense of where the other team is heading while one teammate flanks outside to the tree looking for an angle on B. As always, make sure you’re changing up your opening moves every single round to remain unpredictable. Don’t be afraid to use a shotgun or fusion rifle on Bannerfall. Most sniper battles involve scoping from the same spots every round, right? Use that knowledge to your advantage – if an enemy sniper is going to be predictable and scope out the main doors, punish their predictability with a calculated push. If you bring the fight to them while avoiding the common lanes, you’ll be able to shift the game into a close-quarters fight that will probably end in your favor. Remember to use these positions to your advantage when facing an aggressive team, leading them through these points and using grenades to halt or split them up and wound them. This map is a great sniping map, with seemingly impossible angles, and a ton of different ones to approach, counter snipe and ultimately, take people’s heads off from. Some of these lanes, including lesser known but highly recommended* ones, are below. 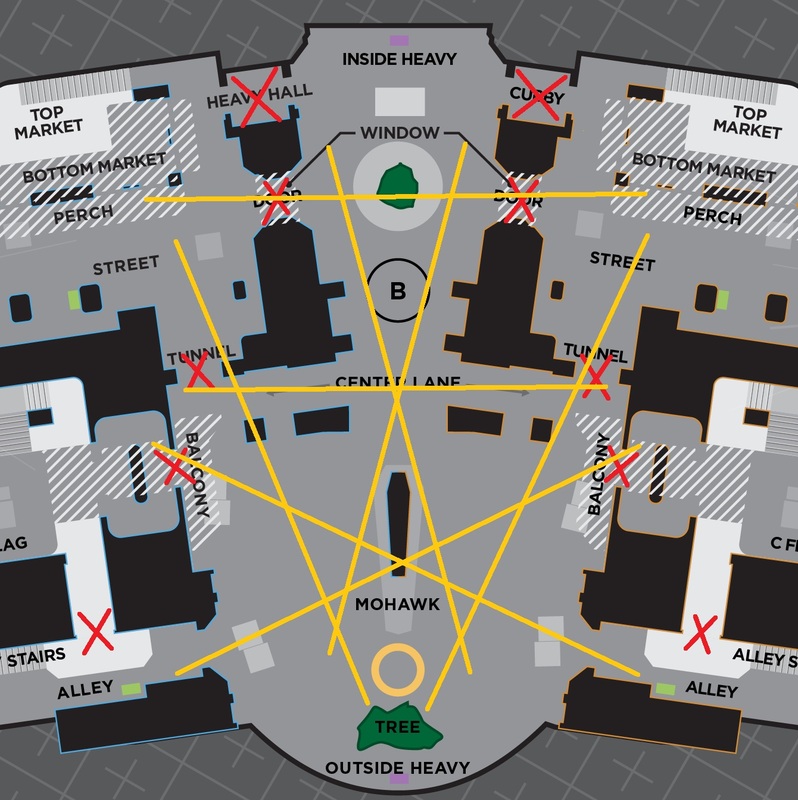 On this map it is best to spread out, don’t all push the same sniping lane and definitely don’t challenge from the same zone sniping, and this will keep your enemy guessing and their heads on a swivel looking out for your snipes. If you had an enemy team completely outgunned, and swapped your positioning every game, they generally had to resort to camping in their spawn, or waiting for you to push outside for flag and sniping you there. Generally less confident snipers should avoid jumping up onto Perch to challenge snipes, as this would lead to difficult orb locations for revives, and ultimately a round loss as you struggled to revive them. Another sniping lane to avoid for less confident snipers is straight down Center Lane which was a common mistake for most, as you can be flanked out to end of Mohawk as you tried for revives. All of these below are identical spots and angles because this is a symmetrical map. This map was all about the angles, as I stated above; flanking worked the same way, but you had to be careful as you will nearly always be on someone’s radar. Flanking would require a lot of distraction from your teammates to pull off, rather than pulling out far far wide to catch them off guard and off their radar. Sending one person out to Alley while 2 others push Center Lane was a great distraction where the enemy would try to get different angles on Center Lane and leave themselves exposed to snipes or flanks with longer range primaries from Alley. Another technique included pushing a couple out to Mohawk in cover, while a teammate would push straight through Inside Heavy / B and could catch opponents from behind who would rush out to try and meet your two teammates at Mohawk. Both teams can push either heavy completely equally on this map, so you have a choice, Inside or Outside. Pushing inside heavy can be a complete mess, but is generally the preferred tactic, as you are less hesitant to pull the heavy, and if left unchallenged while you go to outside heavy, they will always pull it before you and be on you with rockets before you know it. The best way to approach heavy on this map is to send one or two inside to challenge with supers, while one watches outside to delay or prevent heavy being pulled from there. If you don’t have any supers then use grenades effectively and all 3 push inside heavy to overwhelm and rush the enemy team, try and push from different angles and consider running down Center Lane to accomplish this. Click on a weapon to see all available perks. All Adept weapons have the intrinsic Last Resort perk – This weapon handles and reloads faster when the wielder is the last living player of their Fireteam.